I'm excited about the official start of the holiday season. One of my family traditions is putting our Christmas tree up a day after Thanksgiving. This is a tradition that my mom did growing up, and I naturally incorporated into my family traditions. Though, I may change this tradition in the future. Because honestly struggle each year with waiting that extra couple of weeks until I put up my tree. However, I'm thankful that I actually waited this year, because November feels as if it flew by. 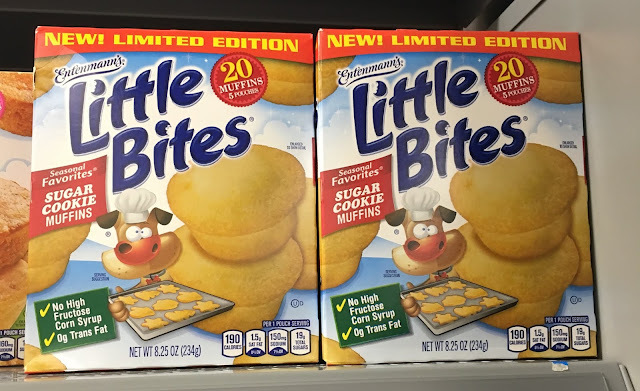 I'm happy that I had the New Limited Edition Entenmann’s® Little Bites® Sugar Cookie Muffins to give me the holiday season taste. This year I'm looking forward to is leaving Santa, a nice cold glass of milk paired with Entenmann’s® Little Bites® Sugar Cookie Muffins. I'm so excited about this seasonal treat hitting the shelves this holiday season for the first time. These are actually the Mister's favorite flavor. He's really picky, and not much of a snacker, and I've already added the Entenmann’s® Little Bites® Sugar Cookie Muffins on my next shopping list. I love that they bring the classic taste holiday sugar cookie into a new mini muffin form. Plus, they're only 190 calories per pouch, and of course, they don't contain high fructose corn syrup or trans-fat. I plan on bringing a couple of boxes with me this Thanksgiving. I conveniently found them at my local Walmart, and they were fully stocked. I can't wait until my next shopping trip! and of course, I'll have some with me during Black Friday! Have you tried the Entenmann’s® Little Bites® Sugar Cookie Muffins? You can also try this yummy recipe! I usually have my tree up by now because, you know, blogging and stuff. However, I'm running way behind. Guess mine will go up the weekend after Thanksgiving as well, after I decorate our church for the holidays. We love these! My kids enjoy having them as a snack. I do as well. I love all the different flavors. I'll have to enter to win! my kids ( and myself ) would be all over this- ill be hunting the stores now for them ha! YUM! I love Little Bites and pack them in my kids lunches. I have to try this new flavor it looks like it will not disappoint us. We love little bites in fact we have in our shopping list almost every weekend. They offer varieties of flavors too goodluck to everyone. I wish wd can all win. I would like to try this flavor. We love the chocolate chip variety too. Had fun decorating the tree with the kids. The sugar bites sound delicious. We usually purchase the blueberry bites. I have yet to try the sugar cookie flavor! We love little bites! These sounds delicious. We usually but the birthday cake muffins. I did not see these in our supermarket! I bet they are delicious! I'll have to search for them next week! My kids used to love these little bites muffins. These sugar cookie flavored ones would probably still tempt them now. Little Bites have become a staple in our home over the last 5 years. My kids love them. Who am I kidding? I LOVE them. Not only are they tasty but they save me a heck of a lot of time and stress when the kids are procrastinating and running late. We haven't tried this little bits. It looks like something my kids would enjoy as after school snack. My family loves Little Bites muffins! So easy for on the go and SO yummy! Our go-to flavor is blueberry, but I really want to try the sugar cookie now. YUM! I love the little bites. I haven't tried this kind yet though. I'll have to check for them when I go shopping next. You know, I have never tried these. I think I'm going to have to pick some up this weekend. They look so good. I like Little Bites a little too much, lol. I eat them as much as any kid does. These look tasty! I love mini foods, they are great for kids and parties. Little Bites are a great handy food! The muffins are tasty, and not dry at all. We have not tried the new sugar cookie ones yet. They sound so good! My kids are completely head over heels for little bites! We haven't tried this kind yet but I saw them at the store, so I will be sure to grab them! The sugar cookie flavor sounds great! I love the blueberry little bites the best. I would love to try this flavor! Our favorite is Chocolate Chip! My daughter loves Little Bites, I buy 2 boxes every two weeks. We love the Snickerdoodles, the Strawberry, Party Cake, and now we need to try Sugar Cookies. I haven't tried the sugar cookie yet. I love the crumb cakes! They're so good. My son loves these! They are a staple in our house for a grab and go quick morning breakfast and snacks. We love Little Bites especially the mini blueberry muffins. These are so good! My kids love them. I like to keep them in our snack cupboard for when they get home from school, they are always starving when they get home. Always boggles my mind why they have lunch at 10:45 in the morning and then no snacks any time during the day and they don't get home until 3:30, poor little things are so hungry by the time they get home to me! I love Little Bites, this flavor looks really good. Little Bites are delicious. I like chocolate chip Little Bites. I buy these for my son's lunch. He loves them!